1. 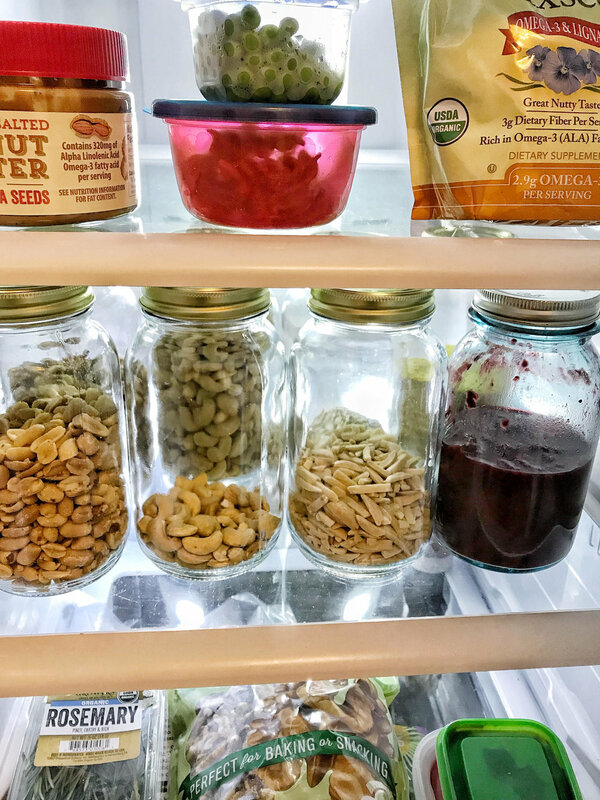 Use up produce: Even though I make a meal plan every week where I plan out about 6 meals I intend on cooking, things come up and sometimes we just don't get to every single meal on the list. This inevitably leaves us with some produce that needs to be used up. Things like carrots, cauliflower, and broccoli I love to roast and make a big hearty bowl with quinoa and/or lentils, and then I whip up a yummy pesto or tahini dressing. Quick tip: BANANAS. We buy about 20 bananas every week. We eat probably half and then freeze the other half for things like smoothies and smoothie bowls and banana ice cream! I usually freeze 2/per plastic sandwich bag after I've cut them into bite sized pieces (easier for blending). 2. Toss out leftovers you didn't get to: We very rarely have leftovers that we have to throw away but occasionally we just don't end up getting to something and need to toss it out. This will free up your tupperware for the upcoming week and meal prepping as well! While you're tossing out or using up your leftovers, take a quick minute to wipe out the surfaces in your fridge. This will prevent you from having to block off an entire morning to deep clean your fridge from all the drippings and whatnot that build up over time! 3. Take inventory: Grains and dry goods don't get used up as much as produce, obviously, so you likely won't need to buy things like brown rice or soy sauce every single time you go shopping. Make sure you know what you've got in stock in your own pantry before adding to your list. Funny story: Our family LOVES buffalo sauce. We make buffalo cauliflower, buffalo veggie burgers, buffalo roasted potatoes, etc. For some reason I NEVER think we've got a bottle (or enough bottles) so we ALWAYS have at least 2 bottles on hand. Not because we use it every week but when we are making something with buffalo sauce I just never think we've got enough--spoiler alert--we always do. HA. Hence the importance of taking inventory. Here is a quick recipe for a roasted veggie bowl if you ever find yourself wondering what to do with those leftover spuds, greens or cruciferous veggies! Preheat oven to 400 Degrees and line a baking pan with parchment paper. Chop your chosen/leftover veggies into bite sized pieces. Try to make them similar in size so they cook evenly. Season your veggies with olive oil and salt and pepper, tossing to combine. For your "harder veggies" like potatoes and cauliflower you will want to roast at 400 for about 20-30 minutes, flipping half way through. Vegetables like broccoli, green beans, and brussels sprouts only need about 15 minutes or so, total to soften up and get browned a bit. Quick tip for roasting potatoes: If you like your potatoes nice and crisp on the outside, when it is time to flip them, crank the heat to about 450 to finish cooking and they will be perfectly crispy on the outside and soft on the inside! Combine all ingredients and add water until a pourable dressing is formed. You can customize this recipe by adding different spices like turmeric, cumin or even BBQ sauce or basil. Add your veggies, grains, beans, and/or greens if you're adding them, to a bowl and drizzle on the tahini dressing. Enjoy!